DAW developers have been active. Ardour2 has reached release 2.8.4, and Ardour3 is close to its first alpha test stage. I've been lightly testing Ardour3 recently, and I like what I see and hear. MIDI is the Big Deal in Ardour3, and I must say that its implementation is impressive. Only the developers can say when we'll see a non-beta public release, but I suspect that 2010 will be the year of Ardour3. Meanwhile, if you want your audio and MIDI data served on the same plate you could check out the latest MusE 1.0. Notable improvements include support for VST plugins (via the dssi-vst bridge), extended JACK features, Python scripting, and a series of video tutorials by user/developer Robert Jonsson. If you haven't seen MusE in action for a while check out Robert's videos and his music for some excellent demonstrations. Kjetil Matheussen has written and/or contributed to various Linux audio projects. His jack_capture utility is used by Guitarix (see above) for its recording module, and like its host jack_capture has been updated recently. Kjetil has also assumed the maintenance of some unique software, including the strange and wonderful Mammut and Ceres spectral effects processors, also recently updated and available from the same site as jack_capture. Ach, I almost forgot to mention that the Hydrogen (Figure 3) drum machine/rhythm programmer climbed to its 0.9.5 beta stage in December. So many improvements attend this release that I'll have to re-review it. 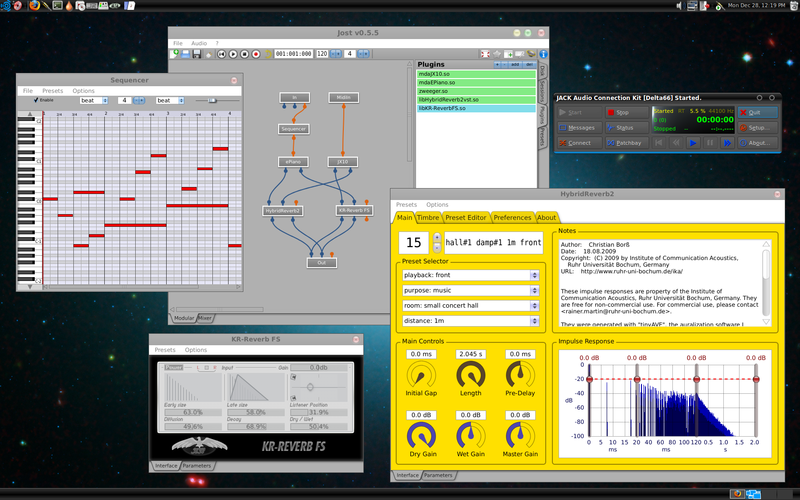 This latest version includes many neat features such as an improved matrix editor for instruments other than drums, a non-destructive sample editor, and a new composition timeline. I've built and tested this release, and in lieu of a full review here I'll simply note that performance was first-rate during my short tests. Check it out yourself, and be sure to let the developers know how it works for you. They'll appreciate the input. The emerging LV2 audio plugin standard continues to emerge, slowly but steadily. Outstanding contributions (Figure 4) came from the developers at linuxDSP, Invada, and CALF, and if those plugins are any indicator then LV2 is looking and sounding very good indeed. Hopefully we'll see more LV2 plugins appear in 2010. Work never ceases on the lower levels of Linux. Recent kernels have improved impressively with regards to performance in multimedia playback and production systems. My recent update to Ubuntu Karmic was a most pleasant surprise (see below), and I was amazed to discover that performance under its non-realtime kernel was good enough for all playback and some lightweight recording purposes. However, production performance improved greatly with its 2.6.31 rt kernel, particularly when running JACK-aware applications. Speaking of the kernel, release 2.6.32 has recoded all kernel Firewire drivers for improved compatibility with the FFADO project, good news for all recordists with Firewire audio interfaces. Finally, the indispensable libsndfile, Erik de Castro Lopo's gift that keeps on giving so much to the developers of Linux audio software, was updated to version 1.0.21 just in time for Christmas. The list of native Linux VST plugins has been expanded, thanks to String, a new synthesizer from Loomer that emulates the sound of Old School polyphonic string synths. In August of this year Loomer also released Shift, a granular pitch shifter and delay unit. Like all of Loomer's products these new releases are available as plugins or standalone applications. Yes, this software is commercial and proprietary, but it also provides welcome additions to the Linux softsynth and effects processor racks. 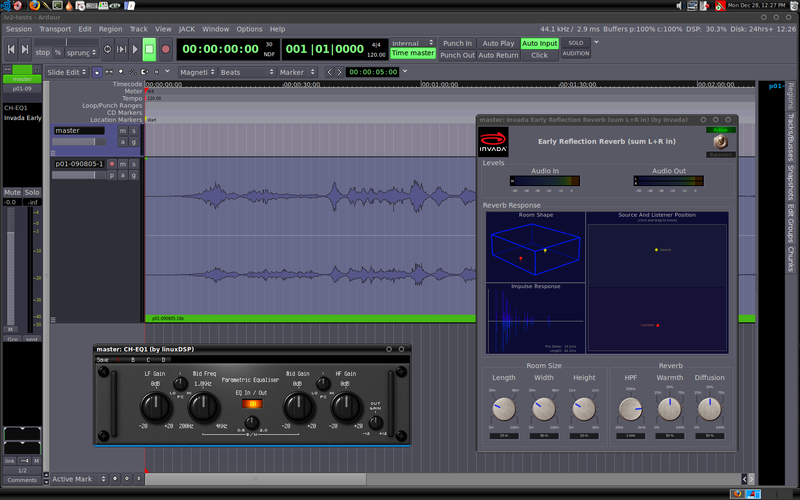 KResearch has also joined the rather exclusive group of native Linux VST vendors with their KR-Reverb FS (see Figure 1). The FS stands for Free Series, though here it's "free as in beer". This reverb unit is KResearch's first Linux plugin, hopefully we'll see more of their interesting processors in free and/or commercial versions. Renoise 2.5 entered its beta release stage in December. A slew of notable improvements have appeared with this release, including a new and extremely cool Pattern Matrix editor (Figure 5), improved MIDI mapping facilities, new internal plugins, a utility to convert VST instruments to Renoise instruments, and so on and so forth. You can read the big list of changes in 2.5 yourself, and if you don't know what can be done with Renoise make sure that you check out the music from Modlys cited below. The programmers at Modartt have updated their awesome Pianoteq software for physically-modeled keyboards. Registered users can also download a new add-on, a very cool-sounding cimbalon, also known as a psaltery. If you're not familiar with Pianoteq check out my review and listen to the demos at the Modartt site. Pianoteq is one of the finest synthesizers I've ever used, in hardware or software, and its piano sounds can't be beat. I'm thrilled that the developers have made a version for Linux, and I don't hesitate to recommend Pianoteq to Linux music-makers. 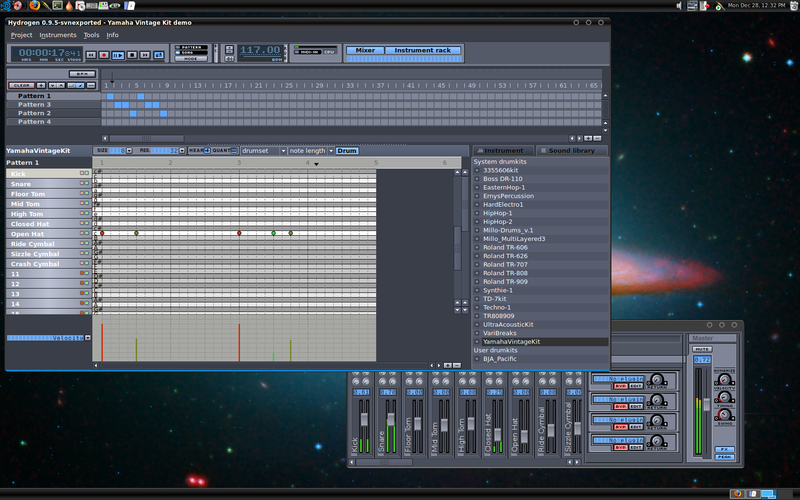 Like Renoise, this is commercial music software "done right" for Linux and worth every penny of its price. I've also written about JMSL, a cool synthesis/composition environment similar to Csound and SuperCollider3 but based on the capabilities of Java. Those capabilities include JavaSound, an API for audio playback and production. However, one of the key components of JMSL has been JSyn, a plugin for Java-savvy Web browsers running JMSL applets. Alas, no Linux version of JSyn has been available, but now that's all changed. Developer Phil Burk has released a pure-Java version of JSyn that runs on any machine with a JVM, and of course that includes Linux. Patrick Shirkey gets my award for Best Gift of the year, thanks to his work on the Best of LAM 2009 collection of music made by the users of the Linux audio software cornucopia. Linux-based musicians were busy this year, and Patrick's selections display the talent and creativity of our small but increasingly productive community. The laptop orchestra isn't a new phenomenon but it has taken on a new look with new directions in the Linux Laptop Orchestra, a.k.a. L2Ork, the brainchild of composer/developer Ivica Ico Bukvic. I'll be covering this project in greater depth in an upcoming issue of the Linux Journal, but until then if you'd like to know more about the group and its work check out the L2Ork demonstration videos on YouTube and the L2Ork audio track at the group's site. Modlys is a duet consisting of Atte Andre Jensen and his wife Britt Dencker Jensen. 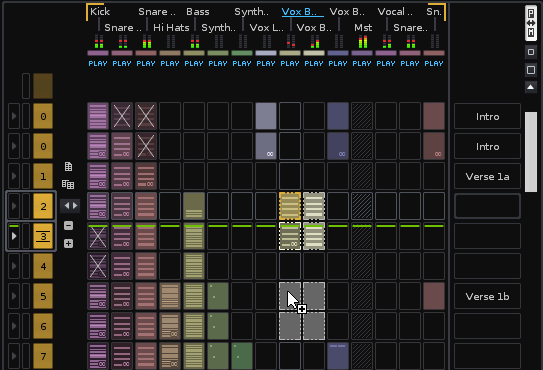 Atte composes with the Linux version of Renoise, with help from various other pieces of Linux audio software. His musical talents are impressive, and his unique harmonies and synthesized sounds provide the perfect foil for Britt's equally impressive vocal talents (she's a great singer). Keeping in the mood of the season, Atte released a series of pieces written for Advent, all of which are available on the Modlys site. This duo's music is very professionally performed and recorded, and I'm eager to hear what comes next from them. By the way, Atte wasn't the only member of the Linux Audio Users mail list who composed music specially for the holidays. Seasonal works were also offered by Julien Claassen, Will Godfrey, and Viktor Mastoridis. Other cool-but-less-like-Christmas music came from Ken Restivo, James Morris, James Stone (another Renoise user), and Tapani Sysimetsa. The main body of the manual was written during a Book Sprint led by Derek Holzer in the moddr_lab at WORM in Rotterdam, the Netherlands, between 23 and 27 November 2009, with input and support from the international community of Ardour users and developers. You read it right, that community of users wrote this "beginner's introduction" in just four days. As might be expected the work is uneven, but it is readable and informative, and users are still invited to correct and add material to the project. Daniel James is well-known to the Linux audio community for his many on-topic articles in various Linux publications. He is perhaps even better known as one of the main developers of 64 Studio, one of the finest media-optimized Linux distributions made to date. More recently Apress has published Daniel's book Crafting Digital Media, a guide to using open-source software in media production for the desktop and the professional studio. At this time I'm impatiently awaiting the arrival of my copy, and I'll be sure to post my review soon after I've read the book. Meanwhile, congratulations to Daniel for making it through to the end of what is truly a mighty labor. As I mentioned earlier, I upgraded my notebook to Ubuntu Karmic. Regular readers of this column may recall that I've had some harsh opinions about Ubuntu, but despite a few remaining annoyances - grub2 didn't update, there's still no audio group, shutdown was problematic - this upgrade was definitely worth the energy. Realtime performance with JACK is excellent, and this time all my hardware is recognized and supported. Overall I'm impressed enough with Karmic to upgrade my other Ubuntu-based machine. I'm also considering an installation for AVLinux, a media-optimized distribution that reached its 3.0 release in December. Founder Glen MacArthur perceived a need for a media-optimized distribution with the latest reliable realtime kernel and up-to-date components. He applied himself to learning how to build a Linux distribution, and his results have found a community of enthusiastic users. I hope to join them soon, just as soon as I find the time to clear up some disk space on one of Studio Dave's machines. Last but definitely not least: The official Call For Papers has been announced for the next Linux Audio Conference to be held in Utrecht in the Netherlands from May 1 through May 4 2010. This conference is the Linux audio event of the year, so make it if you can. See the Web site for more information and details regarding registration and accommodations. Whew, that's a fair number of items for just two months. In fact I've covered only a few of the interesting developments in the ever-changing world of Linux sound and music software, so over the next months I'll get further into some of the apps mentioned in this article. I also have a series to complete on Linux video editors, and my next article will bring that series to its conclusion.